Johnny Rosselli was one of those people who navigated the world by charming everyone in their path, including gangsters such as Al Capone and Frank Nitti, Hollywood censor Joseph Breen, union boss Willie Bioff, Columbia Pictures president Harry Cohn, Howard Hughes, Frank Sinatra and President John F. Kennedy. 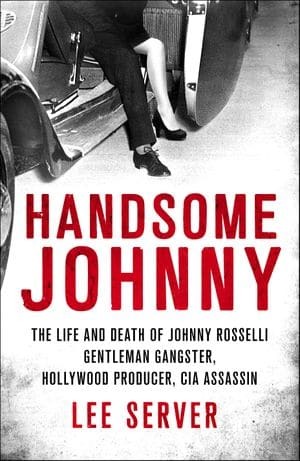 The wealth of stories in Lee Server’s biography, “Handsome Johnny: The Life and Death of Johnny Rosselli, Gentleman Gangster, Hollywood Producer, CIA Assassin,” is undoubtedly worth the price of admission. Born Filippo Sacco in 1905, Rosselli and his family moved from Italy to Massachusetts when he was a boy. Rosselli’s initiation into criminal activity was not much different from other immigrant kids who fell into the life. Enduring instability at home, the boy sought refuge in the streets of Boston. Quickly finding himself too close to a murder investigation, he fled to Chicago and changed his name. It was in the Windy City that he would solidify his dapper demeanor, eventually given the nickname “Handsome Johnny.” It was also during this time he met the infamous Capone. Rosselli did not know Capone well but would stay in contact after moving to Los Angeles. Rosselli’s rise in the criminal underworld paralleled the rise of moviemaking in Hollywood. The City of Angels was largely off the mob’s radar — which is partly why movie moguls set up shop there. When Rosselli arrived, bootlegging was the top game in town, and he thrived by negotiating with law enforcement, buddying up with politicians and schmoozing anyone necessary to land influential friends. During his tenure in L.A., Rosselli connected with people you would expect to see with the “gentleman gangster,” such as mob boss Jack Dragna — who later authorized the hit on the notorious Bugsy Siegel. However, one of the most unlikely friendships came with the film industry’s chief censor, the staunch Catholic prude Breen. Rosselli was not only friends with Breen but was close with his entire family. Breen fought against depictions of crime, vice and sexuality on the big screen during the day only to dine with their human manifestation by night. Rosselli’s connections to the film industry didn’t end there. He worked closely with Hollywood leaders to help mobster Bioff extort the studios throughout the 1930s. Bioff’s racket was to control the trade unions and demand regular payoffs from the studios to avoid strikes. It was a simple shakedown, and it worked well — at least until a handful of studio executives testified against him. Moving deeper into Hollywood, Rosselli spent a brief time as a producer for a small production company named Eagle Lion Films. He first served as a producer on the 1948 prison break film “Canon City.” The next film, “He Walked by Night,” released the same year, was based on the true story of William Erwin Walker, who committed a series of crimes around Los Angeles including the murder of a police officer. Rosselli also found himself working out a predicament in Hollywood surrounding the hit television show “The Untouchables,” produced by Lucille Ball and Desi Arnaz’s Desilu Productions. Many mobsters detested the show’s use of Italian stereotypes. Frustration rose to the point that crime boss Sam Giancana put out a hit on Arnaz. Rosselli stepped in, stopped the hit and suggested Arnaz cast Italian actor Paul Picerni as one of the Untouchables. Arnaz’s life was spared, and Picerni landed a lead role on the show. As Rosselli continued to work in and around Hollywood, the gangster eventually got to know Sinatra and Kennedy, who was soon to be president. In the most fascinating section of this engrossing book, Server details how Rosselli was recruited for a secret plot to assassinate Fidel Castro in Cuba. After multiple failed attempts, Castro eventually learned that the plots came from Kennedy; some believed that the president’s assassination was retaliation. While the JFK murder has long been fodder for overzealous conspiracy theorists, Server carefully rolls out the details of this provocative plot. In the end, Rosselli’s life of crime caught up to him in 1976 when he was found stuffed into a 55-gallon drum off the coast of Florida. There were certainly old scores to be settled, not unlike the recent hit on elderly mob boss Whitey Bulger. Nevertheless, Johnny Rosselli lived like a gangster from the movies — only he was real. Server’s biography not only provides a window into Rosselli’s life but also contextualizes it at a time when Hollywood, politics and organized crime were inextricably linked.